Which foods can help lower cholesterol? Cholesterol is a chemical compound that the body requires as a building block for cell membranes and for hormones like estrogen and testosterone. The liver produces about 80% of the body's cholesterol and the rest comes from dietary sources like meat, poultry, eggs, fish, and dairy products. Foods derived from plants contain no cholesterol. Cholesterol content in the bloodstream is regulated by the liver. After a meal, cholesterol in the diet is absorbed from the small intestine and metabolized and stored in the liver. As the body requires cholesterol, it may be secreted by the liver. When too much cholesterol is present in the body, it can build up in deposits called plaque along the inside walls of arteries, causing them to narrow. Cholesterol does not travel freely through the bloodstream. Instead, it is attached or carried by lipoproteins (lipo = fat) in the blood. There are three types of lipoproteins that are categorized based upon how much protein there is in relation to the amount of cholesterol. Low-density lipoproteins (LDL) contain a higher ratio of cholesterol to protein and are thought of as the “bad” cholesterol. Elevated levels of LDL lipoprotein increase the risk of heart disease, stroke, and peripheral artery disease, by helping form cholesterol plaque along the inside of artery walls. 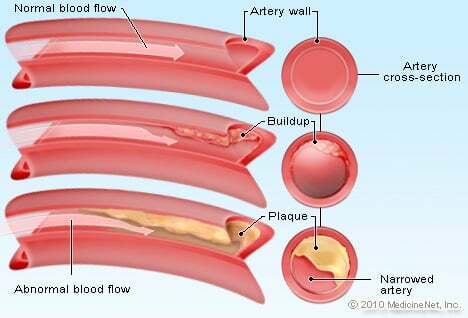 Over time, as plaque buildup (plaque deposits) increases, the artery narrows (atherosclerosis) and blood flow decreases. If the plaque ruptures, it can cause a blood clot to form that prevents any blood flow. This clot is the cause of a heart attack or myocardial infarction if the clot occurs in one of the coronary arteries in the heart. High-density lipoproteins (HDL) are made up of a higher level of protein and a lower level of cholesterol. These tend to be thought of as “good” cholesterol. 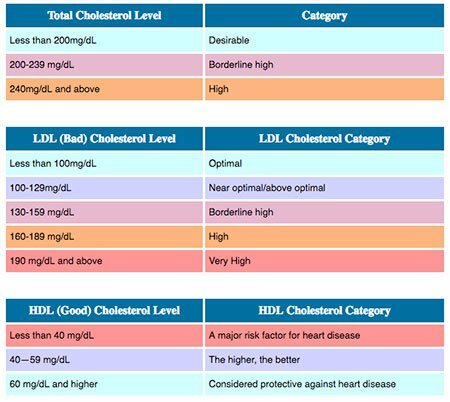 The higher the HDL to LDL ratio, the better it is for the individual because such ratios can potentially be protective against heart disease, stroke, and peripheral artery disease. Very low-density lipoproteins (VLDL) contain even less protein than LDL. VLDL like LDL has been associated with plaque deposits. Triglycerides (a type of fat) may increase cholesterol-containing plaques if levels of LDL are high and HDL are low. Total cholesterol score is the sum of HDL cholesterol, LDL cholesterol and 20% of triglycerides as determined by a blood test. A high score indicates an increased risk for developing cardiovascular disease and/or strokes. LDL cholesterol is called "bad" cholesterol, because elevated levels of LDL cholesterol are associated with an increased risk of coronary heart disease, stroke, and peripheral artery disease. LDL lipoprotein deposits cholesterol along the inside of artery walls, causing the formation of a hard, thick substance called cholesterol plaque. Elevated cholesterol levels are one of the risk factors for heart disease, stroke, and peripheral artery disease. The mechanism involving cholesterol in all three diseases is the same; plaque buildup within arteries decreases blood flow affecting the function of the cells and organs that these blood vessels supply. Atherosclerotic heart disease or narrowed coronary arteries in the heart can cause the symptoms of angina, when the heart muscle is not provided with enough oxygen to function. Decreased blood supply to the brain may be due to narrowed small arteries in the brain or because the larger carotid arteries in the neck may become blocked. This can result in a transient ischemic attack (TIA) or stroke. Peripheral artery disease describes gradual narrowing of the arteries that supply the legs. During exercise, if the legs do not get enough blood supply, they can develop pain, called claudication. Other arteries in the body may also be affected by plaque buildup causing them to narrow, including the mesenteric arteries to the intestine and the renal arteries to the kidney. The liver is responsible for managing the levels of LDL in the body. It manufactures and secretes LDL into the bloodstream. There are receptors on liver cells that can "monitor" and try to adjust the LDL levels. However, if there are fewer liver cells or if they do not function effectively, the LDL level may rise. Diet and genetics both play a factor in a person's cholesterol levels. There may be a genetic predisposition for familial hypercholesterolemia (hyper=more = cholesterol + emia=blood) where the number of liver receptor cells is low and LDL levels rise causing the potential for atherosclerotic heart disease at a younger age. Blood tests are required to measure total cholesterol and lipoproteins. For a complete lipoprotein analysis, the patient should be fasting for at least 12 hours. The goal is to have patients modify lifestyle and diet to maintain cholesterol levels within the normal range. It is important to remember that HDL may protect a patient from heart disease and it may be a treatment goal to raise a too low level of HDL. The American Heart Association has developed diet guidelines to help lower cholesterol levels. It may be a challenge to read the nutritional contents on food packaging and on restaurant menus or to do the math, but the benefit will decrease the risk of heart attack and stroke. Limit total fat intake to less than 25% to 35% of your total calories each day. Limit saturated fat intake to less than 7% of total daily calories. Limit trans fat intake to less than 1% of total daily calories. The remaining fat should come from sources of monounsaturated and polyunsaturated fats that are found in unsalted nuts and seeds, fish (especially oily fish, such as salmon, trout, and herring, at least twice per week) and vegetable oils. Some food groups may be beneficial in directly lowering cholesterol levels and include foods with plant sterol additives, high fiber foods like bran, oatmeal, and fruits like apples and pears, fish, nuts, and olive oil. Some of these foods like nuts and fruits are also high in calories, so moderation is always advisable. Weight loss and exercise are shown to decrease total cholesterol while increasing levels of HDL, the good cholesterol. Smoking cessation decreases LDL levels plus smoking is a primary risk factor for heart disease and stroke. One drink of alcohol a day may help increase HDL levels, but too much alcohol can damage the liver and increase the risk of elevated LDL. Four types of drug classes are used to lower cholesterol levels. Statins: A variety of statin drugs are on the market including simvastatin (Zocor), atorvastatin (Lipitor), pravastatin (Pravachol), fluvastatin (Lescol), lovastatin (Mevacor), and rosuvastatin (Crestor). These drugs primarily decrease LDL. Niacin: Niaspan is the prescription form of niacin and decreases LDL and triglycerides as well as increases HDL. Bile acid resins: Cholestyramine (Questran) is a bile acid resin and decreases LDL. Fibric acid derivatives: Fibric acid resins lower LDL and include gemfibrozil (Lopid) and fenofibrate (Tricor). Statins is the only class of cholesterol lowering drugs that have been directly related to reducing the risk of heart attack or stroke. Alirocumab (Praluent) and evolocumab (Repatha) are two new medications that are antibodies to a protein, PCSK9, a receptor for LDL. These drugs are indicated for treatment in patients who have had heart attack or stroke or have familial hypercholesterolemia and are taking maximum therapy, but continue to have high LDL cholesterol levels in their blood. You and your doctor will discuss what cholesterol medications are right for you based on your current and past medical history, your current health, and any other medications you are taking. These medications often need to be adjusted and monitored for side effects. While all four medication groups may have a role in controlling cholesterol levels in association with diet, exercise, and smoking cessation, only statins are shown to decrease the risk of heart attack. The American Heart Association and the American College of Cardiology recommend that statin therapy may benefit patients with a history of heart attack, those with elevated blood LDL cholesterol levels or type two diabetes, and those with a 10-year risk of heart disease greater than 7.5%. When monitoring how well statin therapy works, the goal for some individuals is no longer to reach a specific blood cholesterol level. Instead, patients with a high risk of heart disease will aim to decrease their cholesterol levels by 50% and those with a lesser risk will aim to lower their cholesterol levels by 30% to 50%. You need to discuss what levels are best for you to reach with your doctor. American Heart Association. "About Cholesterol." Updated: Apr 2017. <http://www.heart.org/HEARTORG/Conditions/Cholesterol/AboutCholesterol/About-Cholesterol_UCM_001220_Article.jsp#.Wb1CX7pFyM8f>> Greenland, P., et al. "2010 ACCF/AHA guideline for assessment of cardiovascular risk in asymptomatic adults: a report of the American College of Cardiology Foundation/American Heart Association Task Force on Practice Guidelines." Journal of the American College of Cardiology 56.25 (2010): e50-e103. Grundy, S. M., et al. "Implications of recent clinical trials for the National Cholesterol Education Program Adult Treatment Panel III guidelines." Circulation 110.2 (2004): 227-239. What lifestyle modification strategies are you using to manage your high cholesterol? Are you taking medication to lower your high cholesterol? Are you eating cholesterol-lowering foods to manage your high cholesterol? Also called carotid artery stenosis, the term refers to the narrowing of the carotid arteries. See a picture of Carotid Artery Disease and learn more about the health topic. What are triglycerides? Triglycerides are particles in the blood that transport fat. They can put you at risk for serious diseases if they are not monitored and addressed. Take the quiz to learn what you can do.